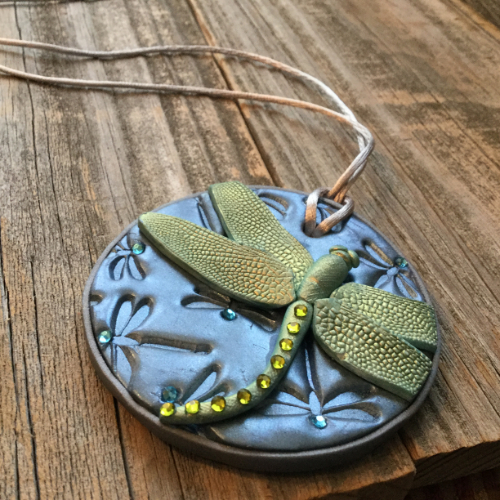 Shimmering dragonflies aplenty adorn this bold polymer clay pendant. Just the right touch of shimmer and sparkling faux gemstones add to its eye catching appeal. Condition and roll white clay to about 1/8” thick. 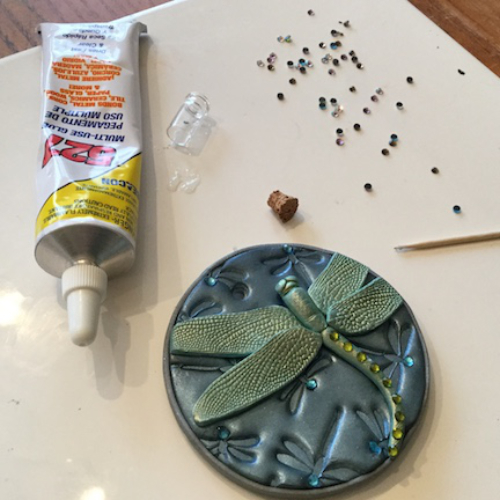 Dust dragonfly wings deco disc with cornstarch, impress into the rolled clay. Repeat. Trim around 2 sets of whichever set of wings you wish to use. Form center of dragonfly by rolling a tube and making one end a bit wider than the other, and bringing the opposite end to a point. I made a body that was about 1 1/2 times the length of one wing. Roll two small balls of clay and gently press to the head for eyes. To add texture I gently rolled the textured barrel of a clay tool across the surface of the body. Then I used a flat edge tool to make indentations to define the head, thorax, and tail sections. 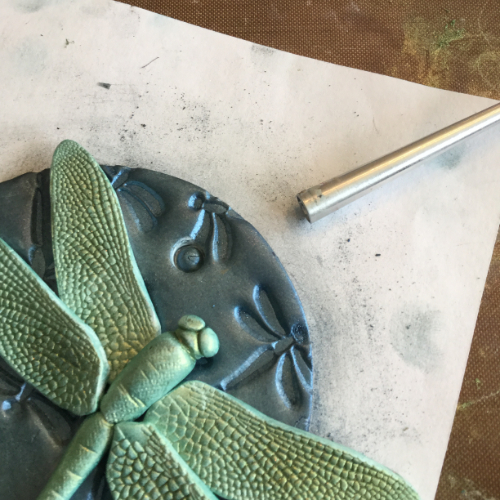 Roll more white clay into a sheet about 1/8” thick and press uninked dragonfly background stamp into clay. 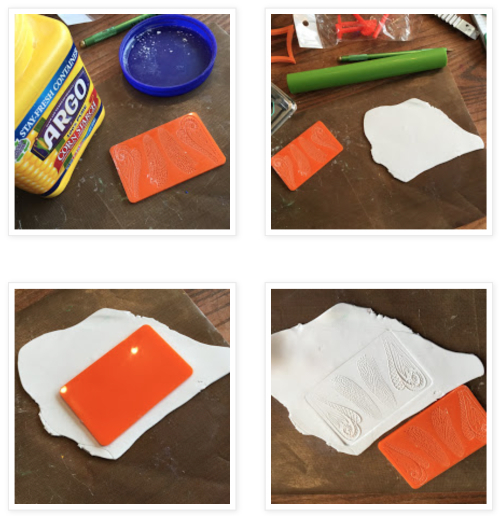 Use circle cutter to cut disc from stamped clay. Dust the surface and sides of the stamped disc with blue mica powder. 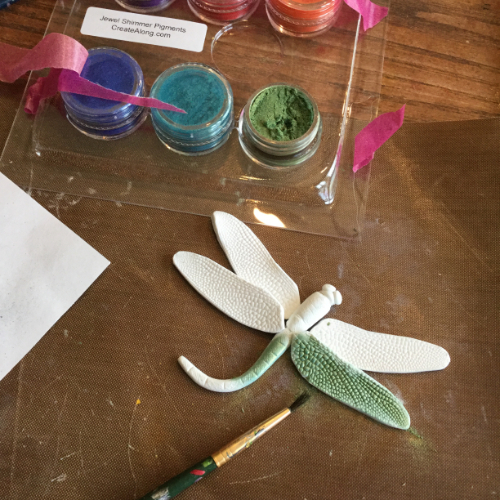 Dust the dragonfly with golden/green mica powder. Add a bit of Bake & Bond and mount dragonfly as desired on surface of the disc. I chose to have the wings extend beyond the disc. (If you prefer to have the entire dragonfly on the disc, use a larger circle cutter to cut the base disc.) 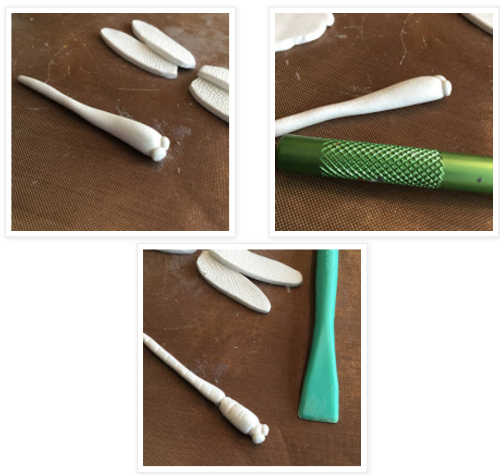 Use the same sized round clay cutter to carefully trim away the wings that extend beyond the base. Carefully add golden/green mica powder to cover the area where the wings were cut. Make a small hole at the center top for the cording. While baking, roll additional white clay and repeat steps to make as second disc base. When pendant is cool, add Bake & Bond and place second disc on the back of the original disc. Bake again according to manufacturer instructions. Let cool. Use rectangular slot disc to extrude a strand of metallic silver clay. Wrap around the outside edge of the pendant. Cut to fit and carefully smooth seam with fingers. Bake again according to manufacturer instructions. Let cool. Use Beacon 527 to mount decorative gemstones as desired. 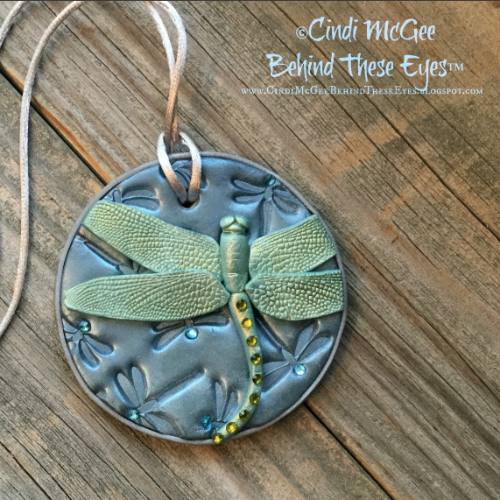 The blue gemstones fit perfectly over the heads of my stamped dragonflies so I mounted one to each dragonfly. The green gemstones were used to enhance the dragonfly. Add silver satin cording and closure. As usual, Cindi creates another beautiful piece. Love the design and surface finish.